Printing at home may be on the decline, but there are still times when we need to print out a document of some sort, even if it’s just the odd school play script. That’s when a double sided printer would be handy, to save paper and money, but you can actually get the same result even without one. The trick is to make use of a lesser known feature of the free Adobe Reader software, which lets you print two sided along with all the proper collation you need to make sure the document comes out ready to go. 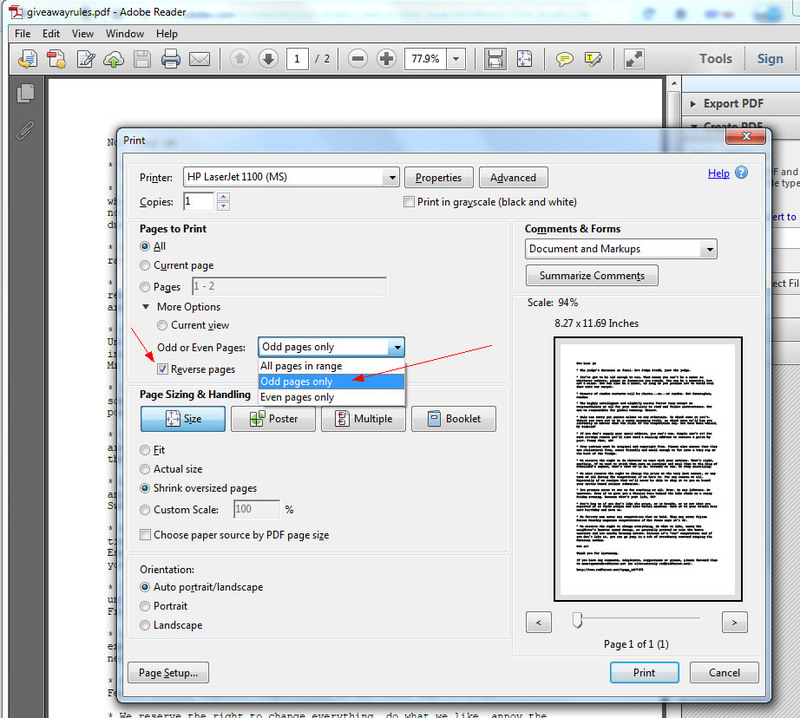 The first thing is to create a PDF from your document, which you can easily do with all the better word-processors. We use the awesome LibreOffice, and there all you need to do is hit File – Export As PDF…, save the PDF file with your preferred filename and you’re done. Once you’ve done that, you start up Adobe Reader (you can download it for free from http://get.adobe.com/reader/) and select Odd pages only from the Pages To Print section, and click the Reverse Pages box. Hit the Print button and print off the document. 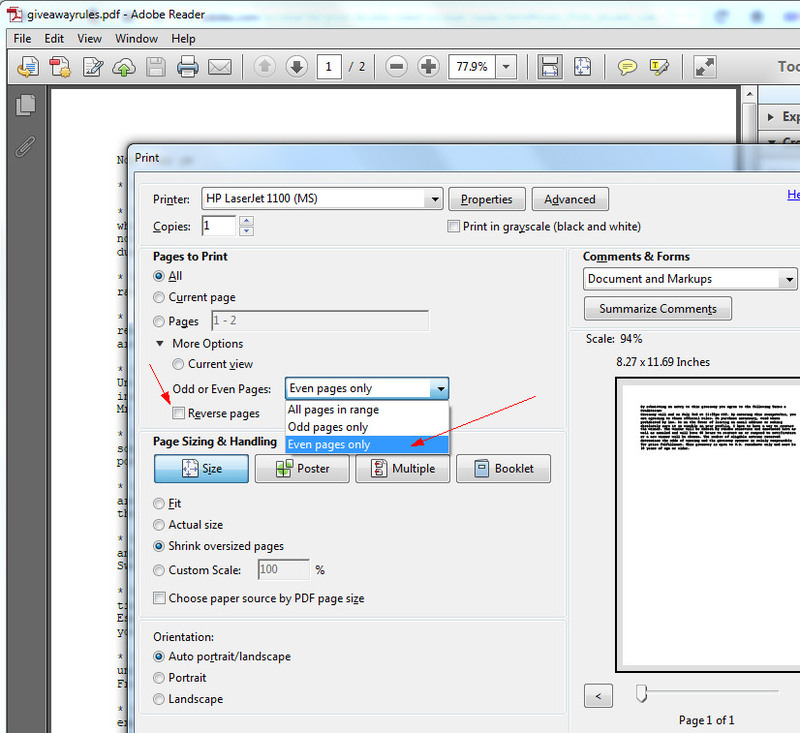 Note that if there are an odd number of pages to print, add an extra blank page to the document to make sure it prints correctly on both sides. Take the printed document out of the printer and return it to the input tray oriented correctly so the pages will print the right way up on the other side. This is the only tricky part, since you will need to experiment with your printer to check to see how to get the print the right way up on the 2nd side of the paper. Experiment with a single blank piece of paper before committing your full document. Once you’re happy and you have inserted the pages back into the printer the right way round, go back to Adobe Reader and select Even pages only, and this time *deselect* the Reverse pages button. Then hit the Print key again, and presto, you will receive a perfectly collated double sided print of your document from the exit tray. I was once asked to print some course work as a pamphlet, I never could get my head around it. Horrible task, I sympathise. :) Booklet software seems to be the only solution to that sort of thing, otherwise it’s just impossible. I used to use something by a company called Blue Squirrel.